Saranac Lake 6er Winter Ultra. Winking at the Adirondack 46. 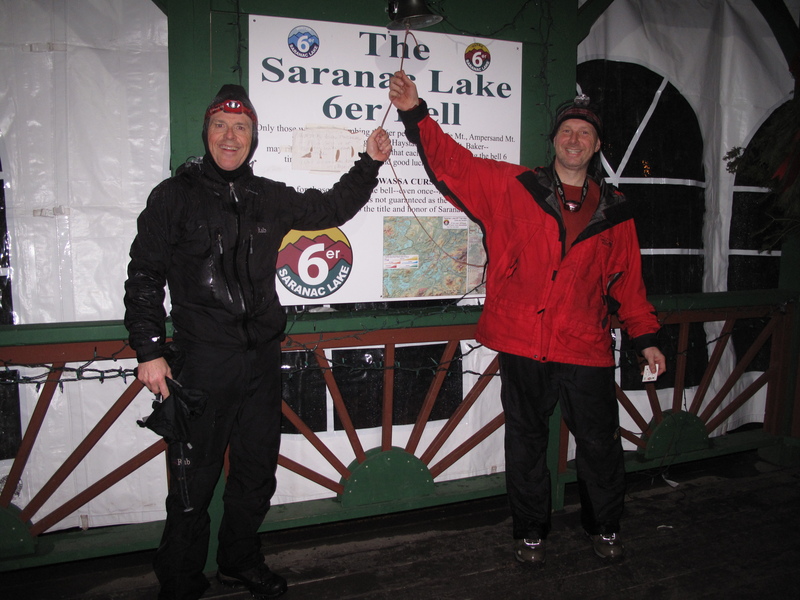 The mayor of Saranac Lake, Clyde Rabideau, had a brain wave when he came up the Saranac 6. which is comprised of 6 mountains near the village of Saranac Lake , NY. The Ultra designation refers to doing all 6 peaks in a single day. On December 21, I competed in the Winter Ultra. Six mountains, five hikes. Each hike the equivalent of at least a 20 km foot race. Here’s my trail report of that memorable day. St-Regis Mountain trailhead, One-fifty pm. One other car in the lot. Steadily falling rain over glare ice. It was my partner, Alistair Fraser, and my 4th peak and we rolled out of the car, put our spikes on and I shouldered my 4 pound pack. At ten to two the time seemed to have wings. We told Sylvie, our driver and support crew, we’d back after 2 and a half to 3 hours and began the hike. All of a sudden I heard footsteps quickly approaching behind us on the short section of icy road that leads to the hiking trail . I turned and there was the man who earlier on, we had nick-named The Rocket. He sprinted past us with an ear to ear grin holding out 6 fingers. Flabbergasted were we. We had seen Caleb Strong on our first summit of the day (Scarface) and even then it was obvious he was a serious contender for 1st place. He was an animal, swallowing up the trail, taking huge chunks out of the distance with every stride. I was suddenly stoked. Our goal was to finish the Ultra in 15 hours and be back at the starting bell by nine pm. The starting gun went of at six am. We had estimated our hiking times and the driving times between trail heads for our remaining peaks over and over again. “Yes we can. We’ll never do it. It’s in our grasp. Might as well forget about it etc. etc”. After watching Caleb disappear up the trail I began to push hard, as hard as I thought I could without crashing and burning. We still had two more peaks after St. Regis: Ampersand and Baker. 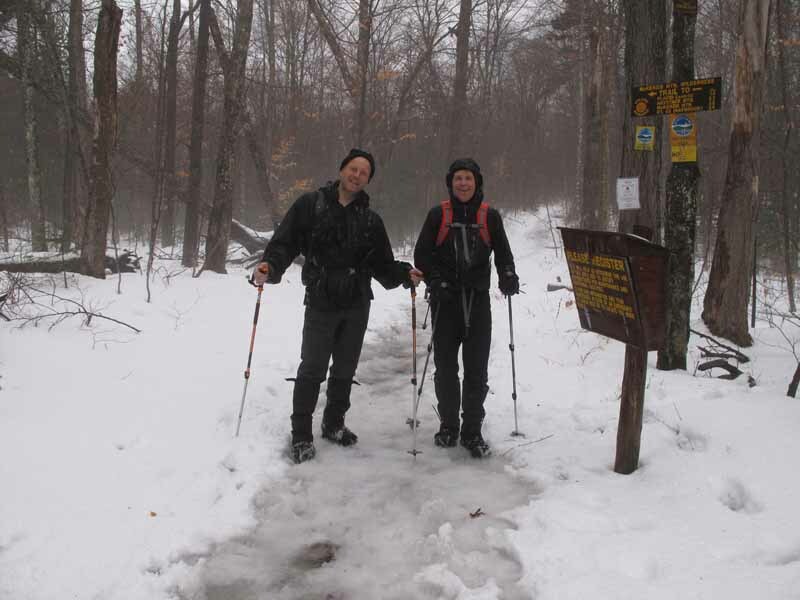 The final third of the trail was a gushing river of water and slush over ice that alternated with deep muck and it had been raining all day long. Our feet were soaked and our boots weighed a ton but we were hot from the exertion. Nearing the top we encountered Nimblefoot (many forum members took part in the Ultra and most of us have trail names) and his partner who seemed surprised that this was “only” our fourth peak. They warned us about the ice on Ampersand and mentioned that Caleb appeared to be bonking up on the summit. We kept moving and when we saw Caleb descending he indeed looked like a man who had given everything he had to the race. I gave him a bag of sugary food and wished him well. We punched our cards after a 1:20 ascent and headed down. Next thing we knew we were at the Ampersand trailhead in the dark (5:10 now- where had the time gone??) and I had no clue where the trail began but a fellow hiker’s driver-father pointed it out to me. Then Terri, who was driving for her husband Topogothics, came walking up and informed us that he had texted her 15 minutes ago as he was leaving the summit. Alistair took the lead and set a perfect pace. Before long we met up with Topogothics who must have sprouted wings for the descent. The ice of Ampersand? Not as bad as McKenzie. Re-assured we booted it up encountering three other descending groups and stopping for quick chit-chat and exchanging beta regarding the trail conditions. The ice was magical. Broad swaths of thick, clean ice, sparkling blue with cascades of water gushing down making music. We crunch-crunched up it getting our feet soaked and suddenly we were on top in only 1:20 (my estimate had been 1:30). Then we lost 7 minutes with a broken punch and I tore my card trying to jam it down over the embossed symbol. To hell with that, I had my Spot track for proof anyway. The icy descent was very focused, careful but quick and we were back in the car for our final peak. It was looking like we might just have a chance of finishing before 9:00. But first a rewind to 4:45 am in the motel room. I was already sipping espresso coffee (brought the machine from home) and finalizing my organization when Alistair wheeled in. We loaded his car and drove to the village square where 80 excited, adrenaline and caffeine-jazzed hikers waited for the gun and, Bang! We were off whooping and running for our cars. Our vehicle was parked strategically and, obeying all traffic regulations, we held up a long line of other hikers’ cars that were continuing on towards another traihead: McKenzie/Haystack as we turned into the Scarface parking area. Nervous excitement made me forget the Spot device in the car and we began hiking at a measured pace. Forum members Nimblefoot and pard, Mike and Scott and Hiker Girl J and Bonnie were also on the trail. We were hiking at an all-day pace when The Rocket whipped by us as if we were standing still. Automatically, our pace picked up and after the punch we sped back to the car. One down, 5 to go. Each summit had a differently shaped punch that we used on our cards to prove we indeed had made it to the top. McKenzie Mountain was the crux of our day in more ways than one. 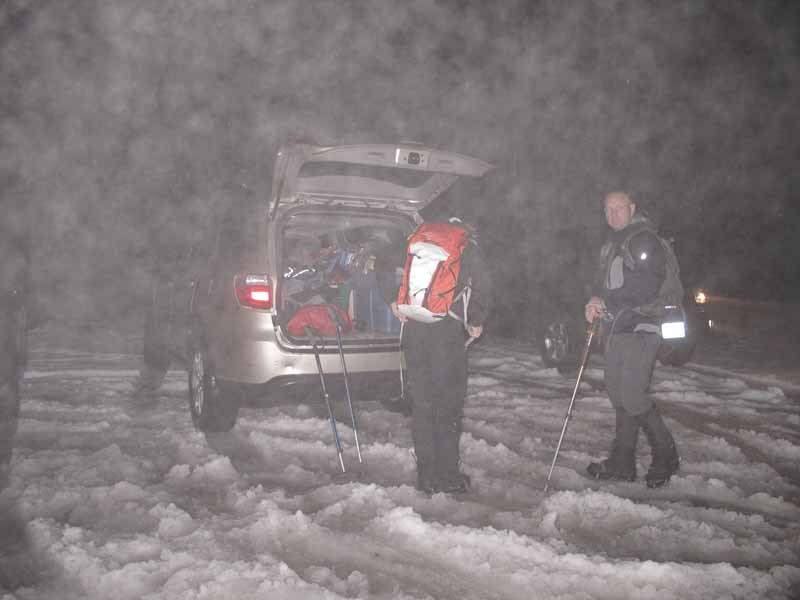 The steepest section was a 1200 foot climb up a mess of steep ice and slush and it began raining hard. There were a lot of people going up and down. We pushed, but not so hard as to loose efficiency or risk a fall descending the icy slope. Packs were dropped after the steep section and from there to the summit and back we went pretty fast. The 35 minute walk out to the Whiteface Inn road was slow. The round trip had gobbled up an amazing 4 hours but in retrospect the measured pace was the key to what to us was a highly successful day. Fast forward to our final peak. I was running the GPS in the car and my unit was set to “follow road” but we still missed a turn near the trailhead. Excitement was running high. I had my final dry shirt on and my hard shell (dry again for the 3rd time of the day) and wore Alistair’s water-proof socks in wet boots. There was no sense in changing pants or anything else. It was 8:00 nearly on the button. One thousand vertical feet and .9 miles one-way. Now was the time to give everything, to completely drain the tank and I pushed like there was no tomorrow. Our reality was concentrated into a tiny laser beam into which there was nothing but a white light of pure, over-the-top effort. This was the ultimate escape from reality. We became machines and every step was a focused effort. Hearts pounding, chests heaving we grunted and snorted our way up and lost and found the trail multiple times. Near the summit the fog and my breath created a shroud of white light that obscured the ground beyond 3 feet but then my beam bounced back to me off the canister. It was 8:25! On our way down we completely lost the trail and began bushwhacking. If not careful we would go way off-course and wind up a mile from the car. Then we found a trail but there were no markers. Now maybe we were heading towards a private home. Aha! A trail marker! I broke into a run along a smooth section and saw a headlamp coming up. Two ships in the night. Behind the light a voice broke the through the foggy darkness, “All RIGHT! Are you done?” I shouted out in the affirmative and held my stride until the trail fell off steeply. At 8:40 we were in the car and Sylvie took a wrong turn, we waited at not one but two red lights. At 8:50 we pulled into the lot and ran up to the tent. Nobody was there. It was dead quiet. The streets all around and the village square were empty. All was still, a silent testimony and reminder that all we do is insignificant yet so important. We rang the bell, took pictures, signed the register and went back to the motel. Alistair’s car looked like a bomb had gone off in it. Sylvie had been scooping my wet clothes up off the floor all day and the stuff sack must have weighed 20 pounds. We managed to separate our stuff and after a hot shower and a hot coffee Alistair hit the road for a 4-hour drive (!). As I drifted off to deep sleep I was walking through a pillow of slush that cushioned my steps. Roughly 20 people finished out of 80 starters. Alistair and I were 6th and 7th. 14 hours and 50 minutes bell to bell. Thank you Alistair. Thank you Sylvie. Thank you everyone who took part in this crazy event.